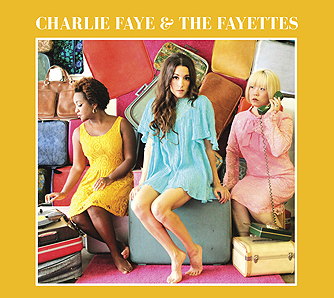 Album Review: Charlie Faye & the Fayettes, "Charlie Faye & the Fayettes"
The first thing that immediately strikes you when you listen to this first album from Austin-based Charlie Faye & The Fayettes is the vintage AM-radio production; a very warm ’60’s feel that works perfectly in the poppy-soulfulness of the Motown vibe. Or if, you’re like me, you can imagine some of these songs being lost Northern Soul classics. But be assured, these three ladies are of and in the here and now and it’s a joyful sound coming out of my speakers that makes me enjoy this album to no end. Think about this – amongst the players on this album include Pete Thomas (yes, him) on drums, Tony Gilkyson on guitar, Roger Manning on keyboards – and so on. The three Fayettes: Charlie Faye on lead vocals, Betty Soo and Akina Adderley on some remarkably silky harmonies have a pretty strong pedigree on their own and this is one of those happy combinations of performers that strike the right balance. Now as for the music itself, which are all original compositions – beginning with “Green Light”, as I said in the opening paragraph, you think this is something straight off the Holland-Dozier-Holland assembly line, right down to the production; “Loving Names” has a Ronettes/Spector vibe and “Sweet Little Messages” reminds me of the groovier soul that Brunswick released in the late ’60’s/early ’70’s (with a Willie Mitchell production behind it). “Heart” has a bubbliness about it which contradicts the heartbreak of the lyrics, which I love; “Coming Round The Bend” is straight-up “Then He Kissed Me” influenced but galloping with a just-right flavor and “See You Again” is another uptempo, completely modern track with a beefy horn section and 4/4 stomp. “Delayed Reaction” is such a romper (a companion to the classic “Breakaway”?) and “It’s All Happening” rounds out the collection in thoroughly satisfactory style in its singalong way. And that’s the key to this album – it’s familiar while it’s now; it’s catchy, bubbly, melodic and a total joy to take in. So if this is only the first from Charlie Faye & The Fayettes, I’d love to hear a lot more in not too long in time. A stellar debut. Who Will Protect Ariana From A Bad Review?